The Iowa City Public Library’s Westgate Collection will be part of the Downtown District Gallery Walk from 5 to 8 p.m. on Friday, October 5. The Westgate Collection features original children’s book art by well-known illustrators, including Dr. Seuss, Charles Schulz, and Margret and H.A. Rey, as well as local artists Claudia McGehee and Jennifer Black Reinhardt. Illustrations by McGehee and Reinhardt are our newest additions to the collection, and both artists will be present during the Gallery Walk. With nearly 60 original artworks displayed throughout the Ellen Buchanan Children’s Room, the Westgate Collection is a unique feature at ICPL. 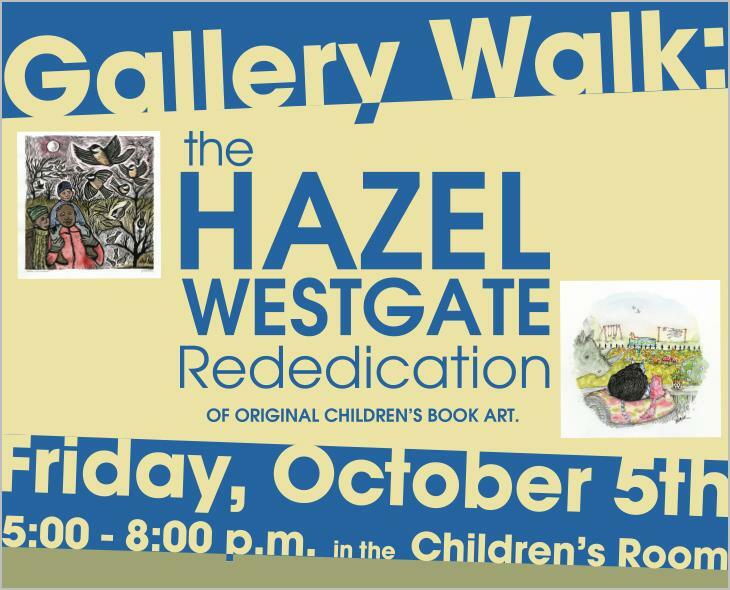 The collection began with long-time children’s librarian Hazel Westgate, who contacted illustrators requesting art she could display in the Children’s Room. The tradition continues in her name. The Library’s participation in the Downtown District Gallery Walk also is a rededication of the collection, which was absent from the Children’s Room during a year-long preservation project. “I think it’s wonderful we had her collection reframed and in some cases restored just in time to mark 70 years of her coming to Iowa City,” Children’s Room Coordinator Angela Pilkington says. “Along with her love of children’s literature, she was a very talented artist and appreciated the art of others. Because of that keen eye and love, we have this wonderful collection. It is our hope that Hazel Westgate’s memory lives on through this collection for another 70 years.” For more information, contact the Library at 319-356-5200.